Rita Plush is here with us on Women’s Fiction Writers today to share her story of writing, querying, and publication. 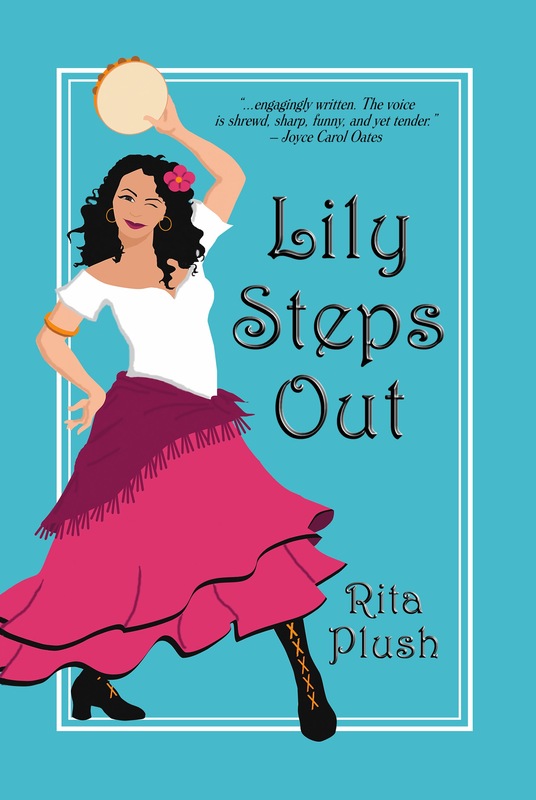 You’re sure to be inspired by Rita and her determination to see LILY STEPS OUT in print. I know I am! Please welcome Rita to Women’s Fiction Writers! Back in the 70’s and early 80’s, with college-aged children of my own, I was a student, plugging away over an eleven-year period to earn degrees in English Literature and Creative Writing. But it was only when I tried to get my first novel published, that I came to understand the true meaning of commitment and patience. Originating as a short story, “Lily Steps Out,” is a middle-age coming-of-age novel about a married woman who ‘steps out’ of her domestic life into the business world after her husband retires. This is an interesting couple, I thought, and continued writing about them. I brought my efforts to my writers’ group and listened to their input and critiques. I worked on the characters, dialogue and plot line. After a time, the pages became chapters. Eventually, I had the first draft of a book which I painstakingly edited and brought back to my group. More recommendations, more character development, till the moment came—five years from that first chapter—when I decided this is a book, and tried to find an agent. The dozens query letters I sent out brought in almost as many rejections—some agents didn’t respond at all—and I began to realize that finding an agent might take almost as much time and effort as writing the book itself. I labored on, and then months later, voila! An agent who liked what she saw—characters alive and vivid with real lives and real problems. Bidding wars and movie deals danced in my head, but alas, though publishers thought the writing “energetic and entertaining” and “were drawn to the characters,” they didn’t take my book. My book. My book was about a woman with spirit and drive, a homemaker who’d spent her life caring for her family and then wanted more out of life than making beds and cooking dinners. Did Lily sit back because things didn’t go her way, or did she risk everything she had to get the life she wanted? And so I took a lesson from Lily. If my agent couldn’t find me a publisher, I’d find one on my own, and offered Lily to the handful of publishers who accepted non-agented fiction. To my disappointment, my efforts fared no better than those of my agent, and something began to nag at me. Was I objective about the book? Or had I developed such a crush on Lily and my other characters that I couldn’t see what was right about them and what was not? Maybe I needed some of that proverbial space between me and them, and so I set the book aside and began another novel. Years passed. Self-publishing had become the route for many authors who couldn’t otherwise get their books into print. Lily called to me. But first, I dug deep, looking for the gold in Lily Gold. I tightened the prose, eliminated every non-essential scene and bit of dialogue that didn’t reveal a character’s personality or move the story forward, updating the social references along the way. I hired a professional editor to proof-read and fine-tune the whole business, and signed up a graphic artist to design the cover. I was so close to self-publishing, I’d already chosen the company and sent them the cover on approval. Then one day I slipped my hand into a coat pocket and out came a scrap of paper with Penumbra Publishing written in my own handwriting. What’s this? I said to myself. The rest, as they say is history, Lily’s history, and the twelve years from start to finish, when I began the book to the day it was accepted. Was it worth all the time and effort? Yes indeed! Keep at it, don’t give up. Rita Plush is an author, teacher, interior designer, and Coordinator of the Interior Design & Decorating Certificate at Queensborough Community College; there she teaches several courses in the program. Rita has also lectured on the decorative arts at libraries throughout Long Island, and at Hofstra University and CW Post-Hutton House. Her writing practice includes fiction and non-fiction and her stories and essays have appeared in many literary journals including The Alaska Quarterly Review, The Iconoclast, The MacGuffin, Passager, and most recently www.persimmontree.org. “Lily Steps Out” is her first novel (Penumbra Publishing, May 2012), and she is at work on a second novel that follows some of the characters in “Lily.” She is also putting the finishing touches on a collection of short stories called “Step into My Heart, the Door is Round and Wide.” Rita is a member of LIAG, Long Island Authors’ Group. “Lily Steps Out” is available through www.amazon.comin both ebook and trade paperback, and from www.barnesandnoble.com in ebook format. Visit her website www.ritaplush.com for more information about Rita and Lily. Beautiful cover and engaging post. Good luck with this Rita you deserve it! Congratulations, Rita! Love that you ‘learned’ from your plucky character and kept believing in this novel. Encouraging advice for all of us! Congratulations. Your story sounds wonderful. Rita, how wonderful to see you here! I enjoyed your inspiring story, but when I got to the mention of Newsday Part II I couldn’t help but wonder if I had read your story there (since I am a subscriber). Sure enough, when I looked you up I not only had read it there but have the actually article on my desk. My mom saw it and said “Look at this woman. If she can do it at 74, you still have time!”. I kept that article to read for inspiration and now here you are at Amy’s blog. Wonderful to see a fellow Long Island writer! Much success to you and I WILL be picking up a copy of Lily’s story! Well, Rita, as someone who self-published her first novel after 25 years of rejections, and who now, at long last, is publishing a novel with Penguin, I applaud your persistence and this inspiring post–we all need to hear how, hey, if at first you don’t succeed, knock on another damn door, and don’t ignore signs from the universe! Your book sounds wonderful. Congratulations! Congrats, Rita. Stories like yours keep me working and believing. Thanks. That’s the way to do it, Bethhavey, keep working and believing. Yes, ma’am. Older women (waving here) can have just as much fun as those young things when that “yes” finally shows up, although I may have you beat in the number of years it took me. Yea, Lily and Rita! Huge congratulations. I’m off to Amazon. It doesn’t matter how long it takes. When you finally get there, it’s worth it. Congrats! Hooray for you for believing in yourself and never giving up. (So hard to do sometimes!) All the best! Yes, it is hard sometimes, but one step at time gets it done. THIS is the story I needed to hear. Thank you, Rita! Glad to help. Keep writing, If I did it, so can you! Congrats, Rita, this is an uplifting story that I’m sure is giving courage to a lot of writers out there looking to get published! And your novel sounds amazing…though I would classify it as a perfect example of a Baby Boomer novel! Am I wrong about that? Isn’t it about transition to a new life on the other side of “maturity”? Just like YA lit and New Adult are about leaving our teen years behind and entering maturity, BB novels are about “coming-of-old-age” which doesn’t necessarily mean giving up on a second life, on the contrary, just like your Lily! BB novels as a new genre are catching on, causing a stir on Internet, and I would urge anyone reading this comments thread and interested in this kind of theme to come and visit the Goodreads Group that was just set up a few weeks ago to discuss BB novels (it already has 129 members and over 35 titles on its bookshelf). We discuss boomer literature and read a BB novel every month with the purpose of exploring BB lit together and better define it. Come and join us, give your input, your opinion matters! Thanks for your kind words Claude. Can I get Lily on the Boomer Bookshelf? Thank you for sticking with it.You are an inspiration. Thank you , Susan, and the best of luck to you.